Henna stains best on clean, dry skin. If possible, avoid applying any lotions or oils to the area you would like to have henna. Henna works by staining the top layers of dead skin cells. For larger designs, we recommend gently exfoliating the area 1-2 days before application. For bridal and other event henna we suggest having your manicure before your henna. • Leave the Paste on the skin for 6-10 hours or overnight. • To remove the paste, gently scrape off (a credit card or blunt edge of a butter knife works well) Do NOT wash your henna! • Immediately apply a natural vegetable oil - olive, coconut, and jojoba oils are just a few that work well. • Avoid water for 24 hours! Henna does not like water! • Apply vegetable oil, shea butter, or natural vaseline to your design every day before showering. For a dark and long-lasting stain avoid swimming, soaking, and dishwashing! 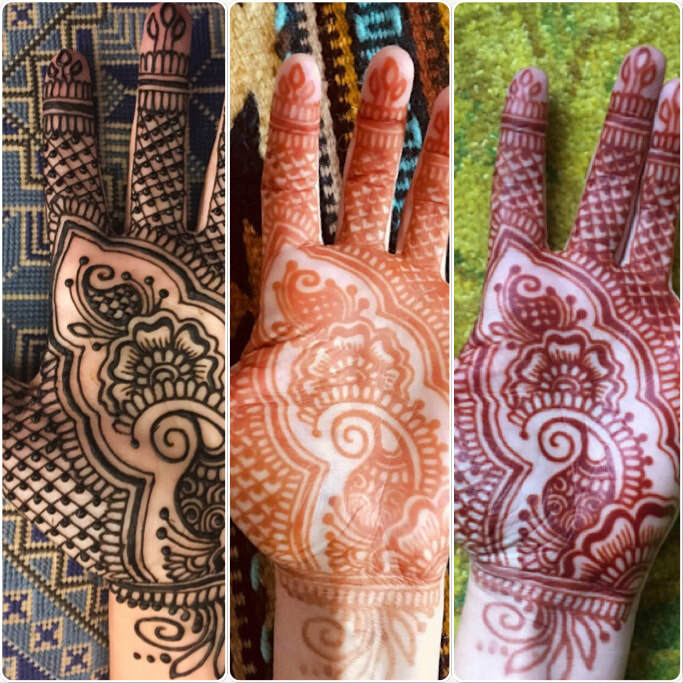 • Well cared for henna designs will last 1-3 weeks!